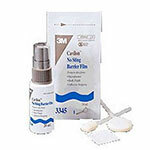 3M Cavilon No Sting Barrier Film Spray is an alcohol-free liquid barrier film that dries quickly to form a breathable, transparent coating on the skin. The 3M Cavilon No Sting Barrier Film Spray comes with a 28.0 mL pump spray bottle and no sting barrier film for evidence-based skin protection. 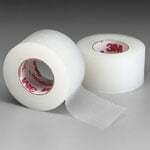 This 3M Cavilon No Sting Barrier Film Spray is an alcohol-free spray that helps to guard against medical adhesive-related skin injuries, friction and bodily fluids. The spray forms a breathable, transparent coating on the skin that lasts for up to 72 hours. 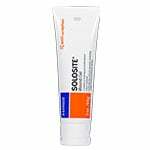 The formula is hypoallergenic and will not sting even when applied to damaged skin. The spray is ideal for protecting sensitive areas against incontinence-associated dermatitis, as it is formulated not to clog or reduce the absorbency of diapers or pads. 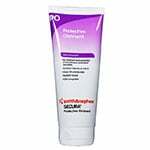 A practical addition to your assortment of wound care treatment supplies, it comes in a convenient pump spray bottle for quick and easy application. Each bottle contains 28 mL of barrier film spray.